If you haven't added sunscreen into your regimen just yet, try one of my local faves! 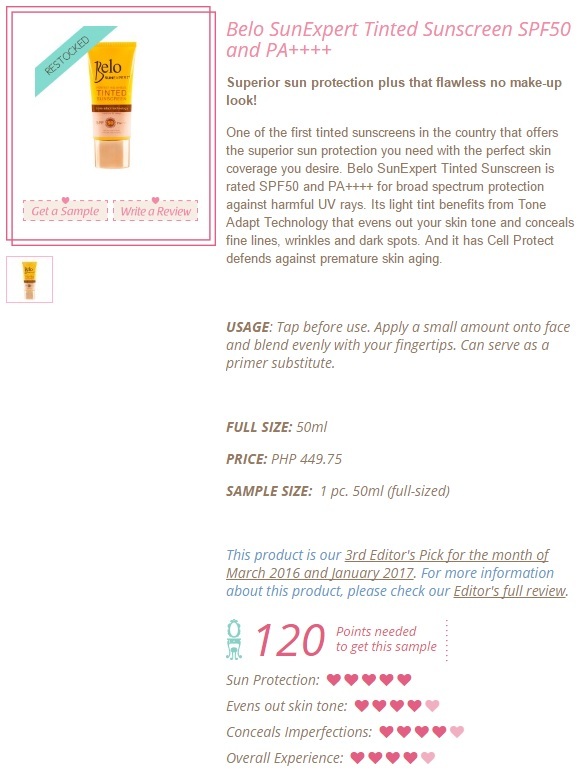 I got my Belo SunExpert Tinted Sunscreen SPF50 and PA++++ in Medium to Deep from Sample Room for free! For only 120 Sample Room points, you can get a 50ml (full sized) sample delivered to your doorstep. That's Php 449.75 worth of savings! The best thing about this sunscreen is that I can reapply it when I'm staying outdoors (I dont' wear a lot of makeup anyway) and I don't end up looking like a hot mess. On days when I only have 2 minutes to prep, this is my go to tinted moisturizer because it's super blendable (checkout my quick vlog! ), matches my skin tone everytime, plus gives me a nice, natural, and clean finish. Have you added sunscreen such as the Belo SunExpert Tinted Sunscreen into your morning routine? What are your favourite brands and formulas? Share them below!